Porsche is back on their game this month as deliveries of the new Cayenne started to show up in dealerships. While sales of Macan models dipped only slightly, 718 sales and Panamera sales suffered by large percentages. With those three models down, Cayenne and 911 growth carried the brand's numbers to just barely over what they sold in September of 2017. With 5,102 total cars delivered last month, Porsche maintains a 3.4% increase in sales year to date over the same 9-month period of 2017. That's pretty impressive. "The new 2019 Cayenne is an exciting addition to a Porsche product range that continues to fascinate people. Our sales in the first three quarters of this year are a powerful testament to the quality and customer experience we offer," said Klaus Zellmer, President and CEO of PCNA. Interestingly, Porsche Approved Certified Pre-Owned sales in the U.S. are hugely up this year. Porsche is up 18% year-over-year on CPO sales. 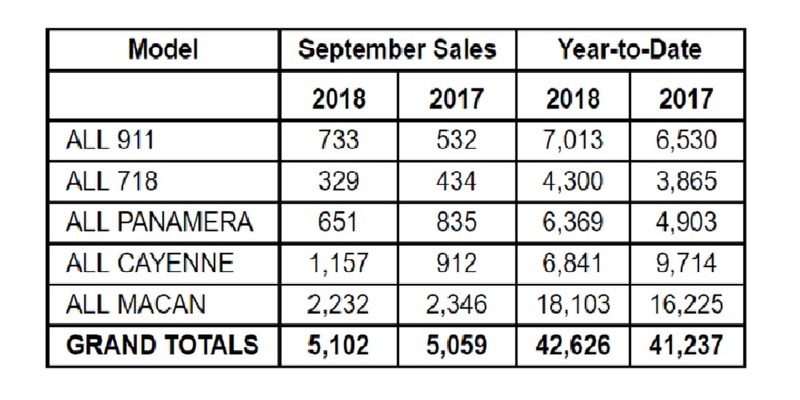 The September total of 1,826 vehicles accounts for over one quarter of all Porsches moved through PCNA dealers across the month.